Hewlett Packard have their traditions in making quality products. The company made around $ 127 billion last year. ewlett Packard have their traditions in making quality products. The company made around $ 127 billion last year. And today we decided to show you the new and pretty functional Probook 4540s. In the exterior there is plasic and metal. Its difficult to stain the surface or leave fingerprints. The corners are rounded and the lines are smooth. The machine may look rough at first sight but that is one of the things that sets HP apart when in comes to design. The Probook weights 2 kg and 300 gr, it’s 375 mm wide, 256 mm deep and 28 mm thick. The upper lid however is thin and flexible and the opening mechanism strong and stable. There we have the SRS premium sound, consisting of two speakers – 2W each. With the volume at its maximum there Is no need for more speakers and there’s no distortion. The display that HP chose for 4540s is a 15.6 inch LED backlit HD with 1366 x 768 pixels resolution. The image is clear and the colors vivid, even when working outdoors because of the anti-glare cover. Also the viewing angle is wide enough. Above the display we find the 2 MP HD web cam. With autofocus, along with a white balance, transition of the image is good and the pictures we took during testing are good enough for you to share with your friends on the social networks. The keyboard has island style keys, which are easier to use and maintain. The buttons have an ergonomic shape and the fingers fit well while writing. With blue color we have the Function buttons that allow you to control the audio and video players as well. On the left right beyond the keyboard is where the multifinger multi-touchpad is located. With a scroll zone and two buttons, which are quiet and easy to press. On the right there is a fingerprint reader for more security. 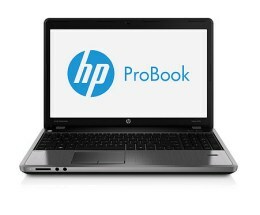 The HP Probook 4540s has a quad core Intel Core i7-3612QM. It has 6 MB L3 cache, and the cores run at 2.1 GHz, with the Turbo Boost at up to 3.1 GHz. RAM memory is 8 GB DDR3 at 1333 MHz, and the hard disk – 750GB SATA II. The video card is also pretty good – AMD Radeon HD 7650M. And in case you’re on a budget there are some other hardware options available. The video card is also pretty good – AMD Radeon HD 7650M. At the periphery we find 4 USB ports, two of which the fastest 3.0 version, HDMI port and standard RJ-35 and 3.5 mm audio jack. The optical device is DVD+/-RW SuperMulti, there is also a 4 in one card reader. The battery types are two possible depending on the different configurations – a 9-cell or a 6-cell, going on for 14 or 7 hours per charge.